Alligator Snapping Turtles can get almost as long as 31 inches and can weight up to 250 lb.. These turtles may live longer than 100 years. The head of an Alligator Snapping Turtle also very large, with very powerful jaws. The upper jaw is hooked and the tongue contains a worm like lure used to attract prey into the mouth. To see many more photos of Alligator Snapping Turtles, visit the photovault. 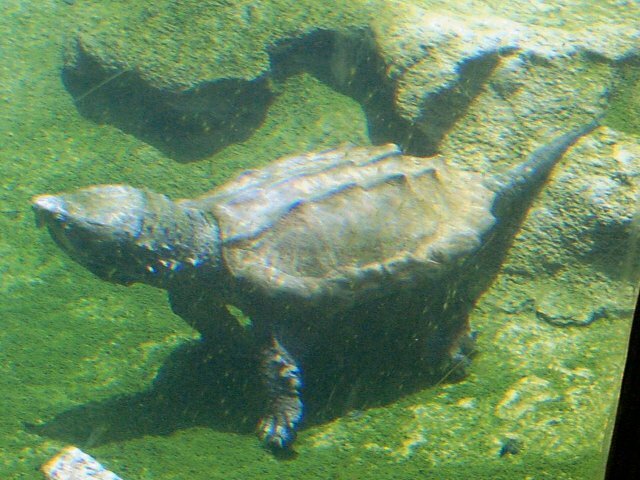 Alligator Snapping Turtles live in rivers whose water will eventually drain into the Gulf of Mexico. They are the largest of all freshwater turtles in North America, and possibly the whole world. Spending most of their time in the deep water of large rivers, canals, lakes, swamps, and bayous, Alligator Snapping Turtles may only go onto land to nest their young. According to the Alligator Snapper Foundation, Alligator Snapping Turtles are sedentary. 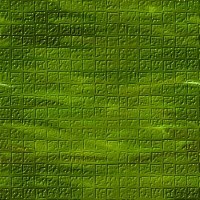 They stay submerged under water for very long periods of time and usually come up for air after 15 to 20 minutes. 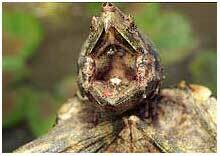 The Alligator Snapping Turtle has a tongue that looks like a worm, which can come in handy when "fishing" for food. They lie very still submerged at the bottom of their current habitat with their mouths open wide. They then wiggle the worm-like projection of their tongue to attract fish that swim by and see it as a meal for themselves. When the fish gets close enough, the turtle grabs it with its very strong and sharp jaws. To learn more about this special feature visit Read the Zoo. Their diet in the wild does not only consist of eating fish; they also eat snakes, frogs, aquatic plants, clams, and even other turtles. 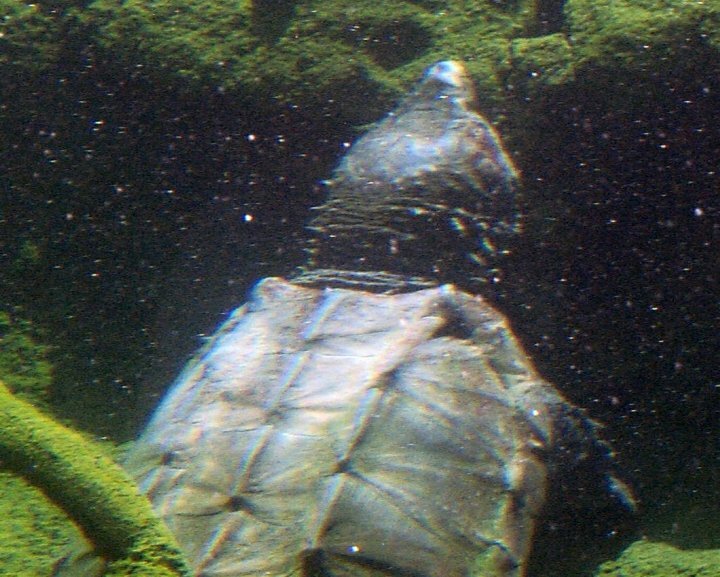 In my own personal observations of the only Alligator Snapping Turtle at the zoo, all it did was lie very still submerged under the water. According to zoo workers, the turtle is on the endangered species list, but is no longer threatened by hunters wanting their meat.